Wooden housing in the private sector is once again gaining popularity after decades of unconditional brick dominance. In this case, there is a combination of the newest and most ancient technologies, as well as some competition between them. This competition raises the question of whether it is better to be a bar house or a frame house? These two technologies differ quite a lot, the only thing that seriously unites them is the main material - wood. This article is devoted to the comparison and analysis of the differences between the two methods of construction. 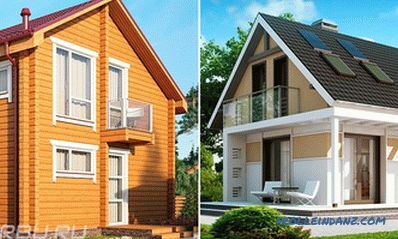 Both types of buildings are based on the same raw material - wood. There are even similarities in the form of materials. And there, and there the main structural material is timber. But then the differences begin. 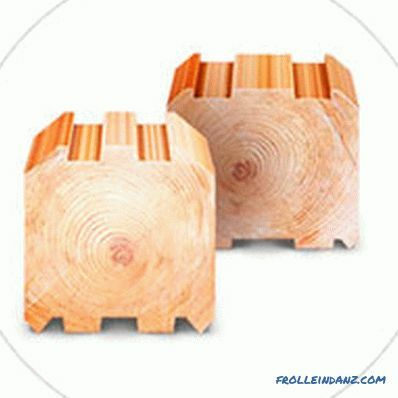 Corner joints and cuts are made on the basis of the same principles as in any log house. Traditionally, inter-spring joints are also made, although screw ties or special fasteners with spring blocks that compensate for shrinkage can be used here. For construction, a bar is used with a width of 100, 150, 200 mm. This size determines the thickness of the walls. There are no fundamental differences between the different material options, but it is worth mentioning the glued laminated timber separately. It is made of well-dried wood by gluing thinner lamellae together. One of the peculiarities of chopped hut is shrinkage, which lasts from several months to a year or two. Installation of windows and doors, final finishing is done either after the end of shrinkage, or using special techniques that compensate for changes in the height of the walls. The time required to stabilize a log house greatly affects the time it takes to complete construction. In frame construction, a house box is a spatial structure consisting of racks, horizontal and diagonal connections. 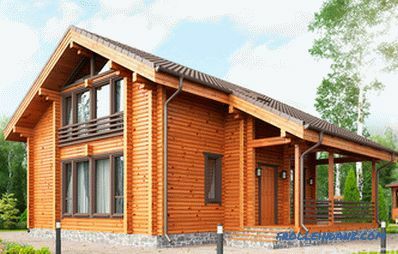 The material intensity of the frame is several times lower than the log house, but its design and construction imposes more stringent requirements on the quality of the project and the qualifications of the builders. 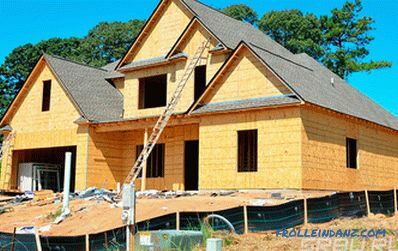 The voids in the frame are filled with heat insulating materials, and the outer and inner surfaces are formed by cladding of various materials - OSB, clapboard, blockhouse, drywall, siding. 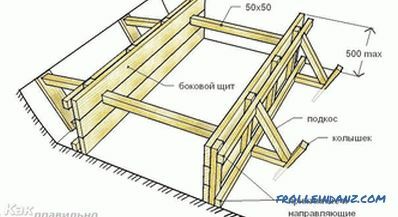 The building frame is assembled from rectangular bars, which are often called planks because of the large difference between thickness and width. The most commonly used section 50x150 mm. 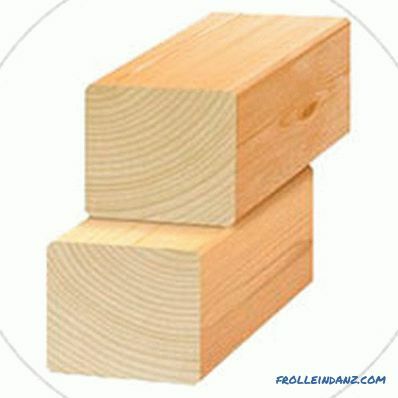 The width of the boards determines the thickness of the walls of the frame. Putting a log house is much easier than building a high-quality frame. For this, relatively simple skills and the same simple tools are enough. Of course, today during construction no one can manage with one ax, but in principle this is possible. As a rule, chopped walls are not covered by any covering. The timber itself forms the interior and exterior of the house. This is also one of the factors that reduce the complexity of construction and reduce its time. The frame is a much more complex structure that requires smart calculations in the design and accuracy in the assembly. All parts must correspond exactly to each other, and the attachment points ensure their rigid fixation. In addition to the “skeleton” itself, a structural and decorative paneling is installed in the frame house, and a heater and vapor barrier are laid. All this takes time, appropriate tools and qualifications of the performers. If, when choosing between a bar and a frame, priority is given to simplicity of construction, then it is worth choosing a bar. Such a house is easier to build and is built faster, except for the waiting time for shrinkage. It almost does not require finishing, the timber is only polished and coated with protective varnish. The frame also requires the use of many additional materials, including finishing. In terms of strength, it is hardly possible to give a definite answer, true for all cases. If a house is built, simple in construction, with a small number of openings, then it is easier to provide strength when erected from a bar. Recall that the assembly of the frame requires a higher qualification and accuracy in work. But if you need to build a building from a timber with a complex layout, with arched aisles, and a large number of wide windows, then the advantage of the timber is greatly reduced. The point here is that as the complexity increases, the number of parts that do not end in a corner or end cuts increases.Such loose ends weaken the walls, despite the use of vertical connections between the crowns. The frame can have any complexity without loss of both bearing capacity and horizontal rigidity. The only indisputable advantage of felling in this respect lies in its mass. A more massive structure should be more resistant to wind loads. But the real result is very dependent on many factors. According to the durability of chopped and frame houses, you can also expect the same results. There are examples of both types of buildings that have stood for more than one century. However, there is no unity in the existing construction regulations. According to departmental building standards VSN 58-88 (p), any wooden walls must remain until overhaul for at least 30 years. For the SRT 00044807-001-2006, the service life until the overhaul of the chopped walls is 50 years, and the frame walls is 20. However, the same document specifies the estimated lifetime of the wooden walls of any structure is 50 years. If this data is averaged and feedback on the maintenance of houses is taken into account, an advantage in this section should be given to a house from a bar. The cost of operating a building is influenced by both the ease of repair, and the frequency of maintenance required, and the number of work done during maintenance. 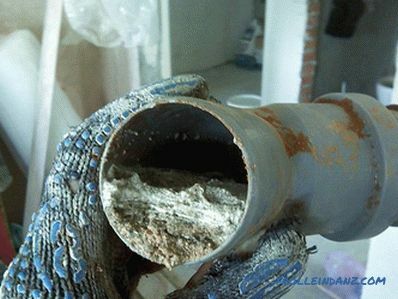 One of the most important factors affecting the frequency of repairs is the protection of structures against biological damage. A bar-shaped house does not have (as a rule) outer skin, and therefore the probability of infection of wood with rot is quite high. The frame is fully protected from precipitation, and with the proper arrangement of the “cake” wall - from moisture coming from inside the premises. 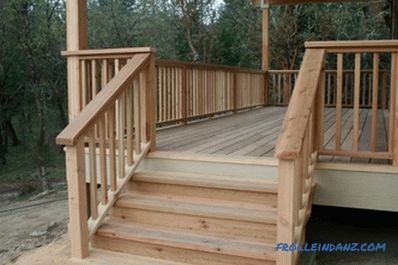 Lack of moisture reduces the likelihood of infection of wooden parts to zero. By protection from insects, it is difficult to make an unequivocal comparison, but given that the intervening joints of the log house can serve as a natural and affordable shelter for them, and the skin of the frame is at least unreliable, still an obstacle, the frame structure should be considered more secure. 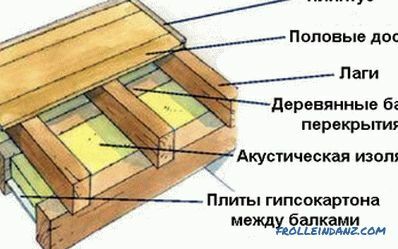 A house made of lumber is more than a frame one, subject to damage by rot, fungus and insects. The skeleton structure on both sides is covered with a covering, and even inspection of it is rather laborious. The walls of the log house are open and accessible both for inspection and for any processing. This is a great advantage. However, if we consider that open wood requires frequent maintenance, and protected it almost does not need, then this advantage does not seem too valuable. 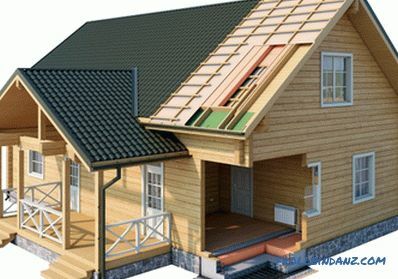 Modern materials are used for the exterior and interior trim of the frame house, the frame itself is better protected from any negative impacts. Due to these factors, the total cost of operating the frame structure does not differ much from the cost for a brick building. In operation the frame house is more unpretentious, than bar-shaped. Therefore, if we compare what to choose, the skeleton or timber for this parameter, the advantage remains for the skeleton. You can often hear or read the statement that wood is a warm material. This is one of the arguments in favor of a wooden house. Bringing it, usually have in mind a log house from a bar. 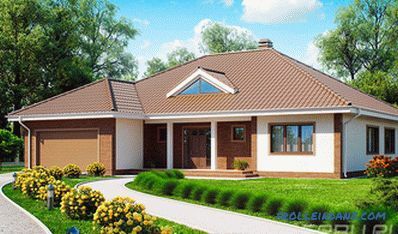 Evaluation of the "warmth" of the house is quite simple, thanks to the clear characteristics for each material. I recall that the voids of the frame are filled with insulating material, most often mineral wool or foam. 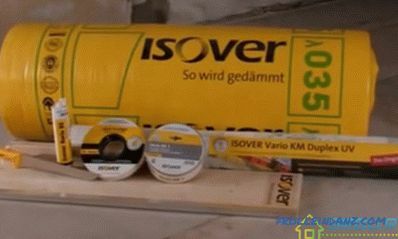 Mineral wool with a density of 50-80 kg / m 3 with a thickness of 200 mm has a heat transfer resistance of 4.4 m² · ° С / W. Pine timber thickness of 200 mm is about 1.6 m² · ° С / W. The difference is about 2.5 times. That is, the frame wall, insulated with mineral wool, much better protects against cold than a wall made only of wood. Even taking into account the fact that a part of the internal volume of the frame is occupied by the same wood, the frame house is much warmer than the timber. The resistance to heat transfer of lumber walls does not meet either the modern requirements of thermal efficiency or sanitary standards for residential premises. 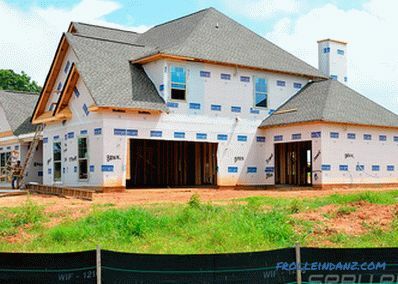 Frame construction initially provides high-quality insulation and does not limit it. This is the question of which house is better for permanent residence, framed or made of timber, can be considered resolved. Fire danger or the safety of a building is a complex characteristic that takes into account a large number of factors and parameters. 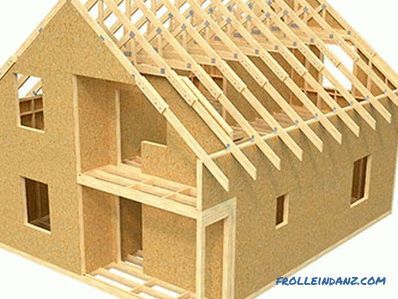 Both frame and log houses are made of combustible material - wood, which means that they are potentially fire hazardous.The difference of a frame house is that it is easy to introduce materials to its design that prevent fire and the spread of fire. First of all, it is mineral wool and drywall. Gypsum plating protects the wood from fire, mineral wool restrains its spread on the walls. Bar-shaped walls do not have such protection, and therefore for them any contact with fire is more dangerous. To increase the degree of fire resistance, the frame structure provides more opportunities than a log house. It is considered that in environmental friendliness the frame house is inferior to timber. Most complaints are caused by the use of formaldehyde in an OSB framework. 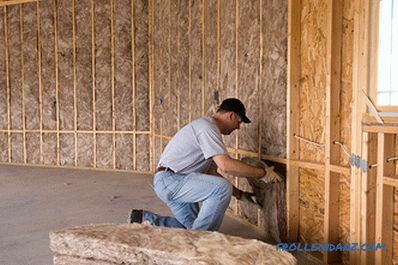 There is formaldehyde in the mineral wool, which is used to insulate the walls. A bar-frame is built from natural wood and therefore is considered more environmentally friendly. Unless, some doubts are caused by glued laminated timber. But in such a house can be used formaldehyde-containing materials. 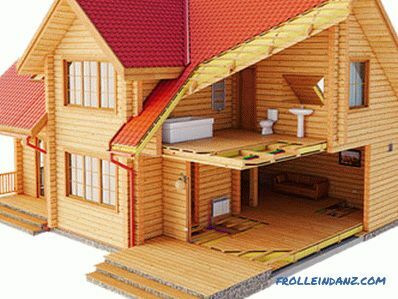 For example, a rough flooring made of OSB, insulation of the attic floor or combined roof of the attic. The effect of these materials in their modern design is minimal, and can be further reduced by design measures and detoxifying coatings. But it is, and affects the overall assessment of environmental safety. Given the fact that in the interior there is probably furniture made of chipboard, laminate flooring or other modern materials, the question of the environmental friendliness of the building structure itself is not so relevant. But still, in this section we will award a conditional victory "on points" to a house from a bar. 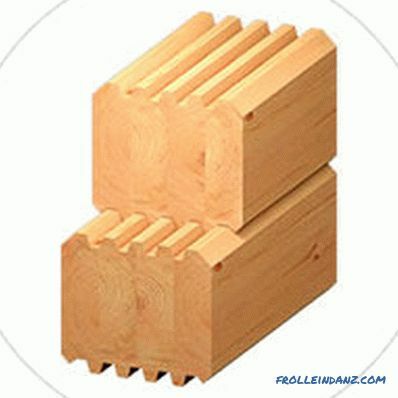 The log house technology allows you to build buildings with a rather interesting architecture - these are terems. Architecture, exterior, interior - these are the main factors for which chopped houses are valued. They really look very attractive, stylish, unusual. For this, their owners are willing to put up with some of the disadvantages of technology. The frame house looks no more unusual than any brick building. But this technology has more flexibility than cutting from a bar. It allows you to create more complex structures, practically does not impose restrictions on the internal layout of the building and on its external shape. The skeleton carcass can look like a modern building, like an ancient half-timbered house, and if it is sheathed with a blockhouse, it cannot be immediately distinguished from a log house. The frame construction technology provides more opportunities for creating architectural forms and interior planning. The solution to the question of which is better - a frame house or a house from a bar cannot do without a comparative assessment of their value. Price can often seriously affect the assessment of the significance of other characteristics. The task of estimating the value “in general” is greatly complicated by the huge number of specific technical, planning and architectural solutions. But you can try to estimate the cost of materials and the number of different works required to prepare the house. Since the roofs, foundations, windows and doors of different houses have the same construction, we consider only the construction and decoration of walls. interior: plaster, paint, wallpaper, ceramic tiles, etc. As you can see, for ace takes less wood, but much more than other materials, most of which is not less than the timber of the same volume. According to the list of materials you can get an idea of ​​the number of operations required for the complete readiness of the walls. 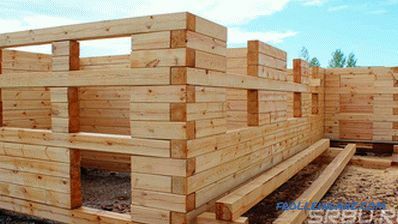 By the number of operations it can be seen that the complexity of the construction of a frame house is at least not lower than the complexity of the construction of the log house. 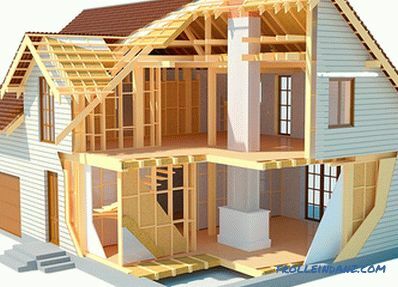 A frame house is more expensive than a bar-shaped one, due to the use of more expensive materials and more work.